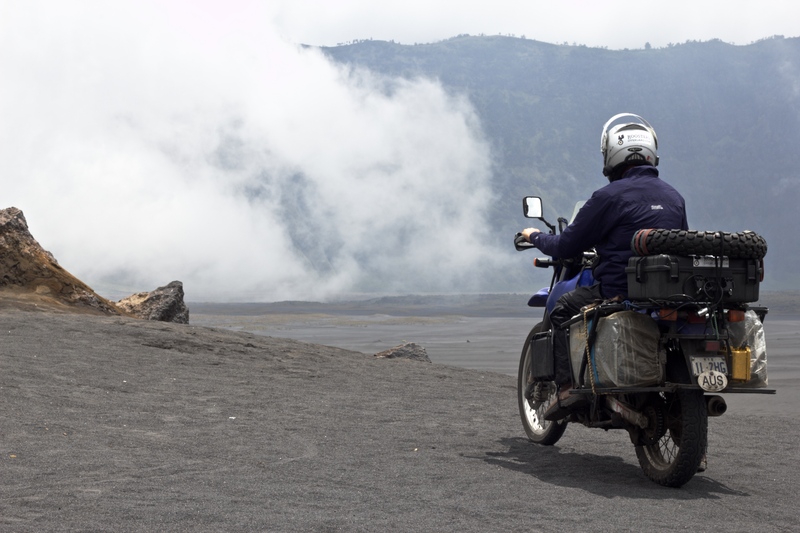 To actually ride a motorbike inside a live volcano is an opportunity that doesn’t come your way very often. Mt Bromo is a constantly active volcano offering the iconic volcano experience, belching out plumes of steam and white sulphurous smoke. It is in East Java, Indonesia, has erupted many times in recent history and is part of the Bromo- Semeru -Tenggerese National park. This was an opportunity we didn’t want to miss and was high on our list of must dos in Indonesia. Having learnt some lessons in Indonesia we decided to take the most common route to the Mountain from the north side, winding up from the town of Probolinggo. The road was supposed to be sealed all the way and being the most used route, we hoped that it would be relatively easy to navigate. Our research told us also that there were villages right up to the edge of the caldera and that accommodation was available. The road ascended rapidly from the coastline and was in fact sealed. Given the unknown condition of the road ahead and having scarce information on how to access the volcano we decided to stay at a hotel half way to the volcano and attempt to get some local knowledge. Hotel Nadia at Sukapura was a good choice and the staff spoke enough English to give us valuable information about the volcano. The amazing experience began the next morning from the time we left our hotel. The road continued to climb through small villages of the Tenggerese people who apparently fled to the mountains after mass arrivals of Muslim Madurese in the 19th century. They continue to be Hindu practising Animism. As we climbed in altitude the air had a distinctly alpine feel to it and the landscape changed rapidly. The road was lined with fields planted intensively with vegetable crops in the most fertile, friable soil I have ever seen. Communities of people all wrapped in colourful blankets were everywhere working the soil and tending young, green shoots. Despite the steepness of the terrain, terraced fields dotted the landscape. The bright houses close to the roadside all had beautiful, colourful gardens. Finally we reached the village of Cemoro Lawang at the edge of the caldera and the park entrance. Rising to the lip we were faced with an eerie vista of the caldera of Mt Bromo. Below us was a vast vista of the Sea of Sands, a flat expanse of black volcanic sand looking more like a barren, grey desert than a mountain top. 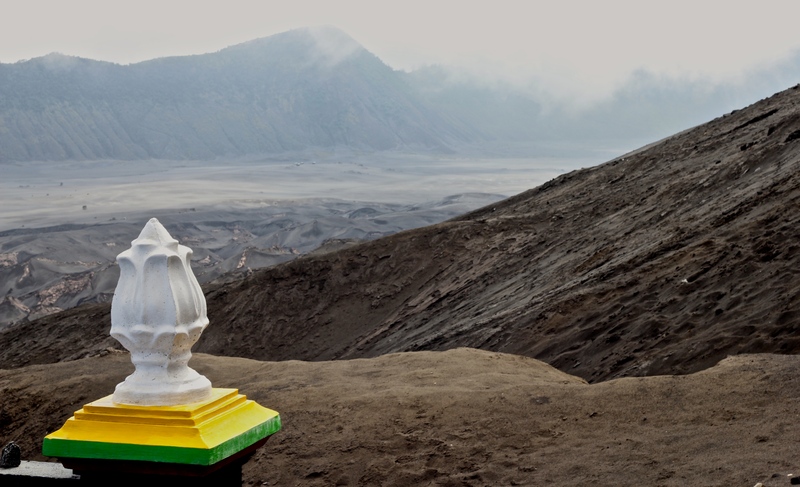 The caldera spans a diameter of approximately 10 km with the steaming Mt Bromo rising from the black sand. We followed the road as it dropped down into the caldera where the way to Mt Bromo was marked by jeep tracks in the sand. The black compressed sand was very stable to traverse and so riding across the flat sandscape I felt like Lawrence Of Arabia atop his stallion! Ahead of us was the classic volcano vent at the base of which was a beautiful Hindu temple, majestic in its simplicity. Nearing the base of the vent we could see horses and jeeps dotting the landscape. Jeeps can be hired to take you around the volcano, but we felt so lucky to have the freedom of our own transport. 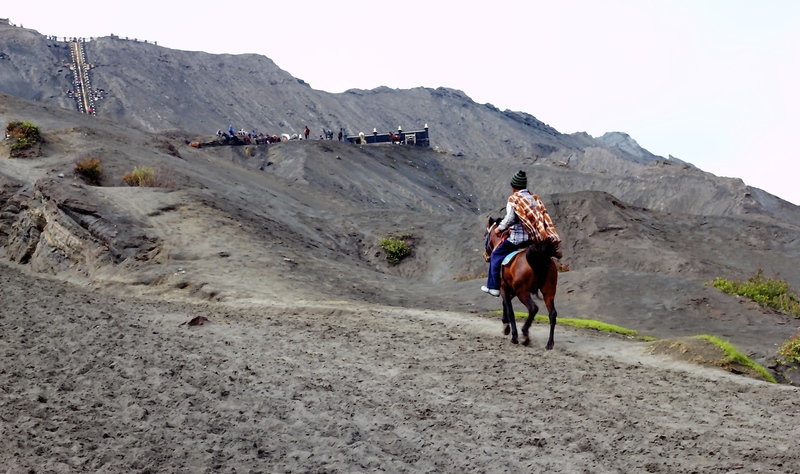 The tiny horses of the Tenggerese people were available as transport part way up to the top of volcano vent. 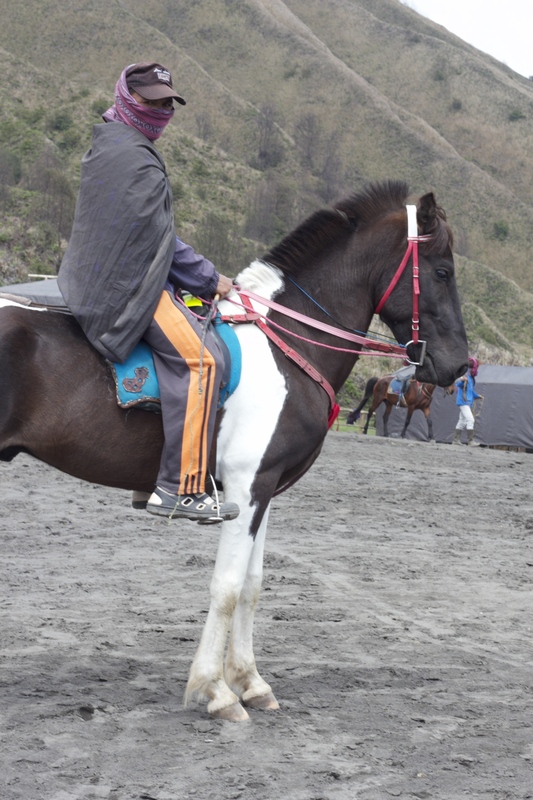 Men draped in their trademark ponchos awaited the tourists who wanted a ride on their small horses with their mohican manes. Parking at the base of the vent, we began the short, but steep climb to the smoking vent. 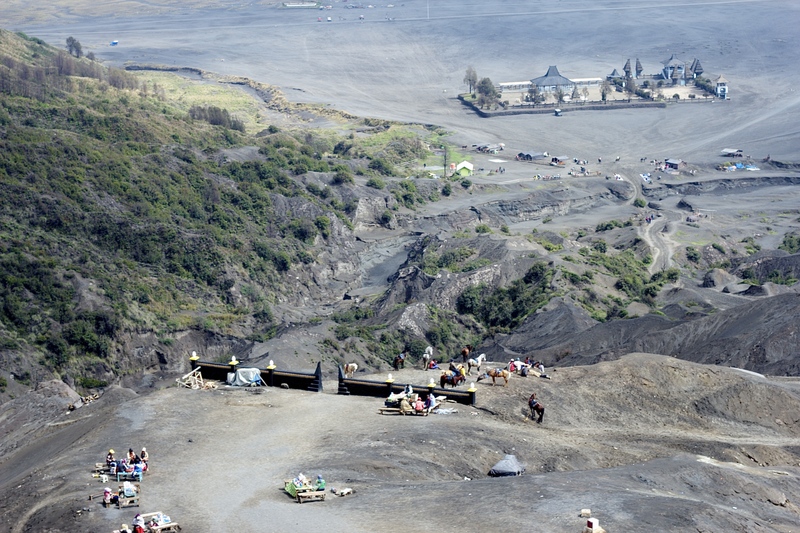 250 concrete steps lead up to the top and an amazing view down into the smoking vent of Mt Bromo. The smell of sulphur wafted up causing people without masks some discomfort. Looking over the edge, it terrified me imagining the religious ceremony of the Tenggerese people which sees chosen men climb down the steep edge to catch the offerings of the local people who ask the gods for a prosperous harvest and to be cured of disease. The hotel Nadia displayed an eerie photo of this event. 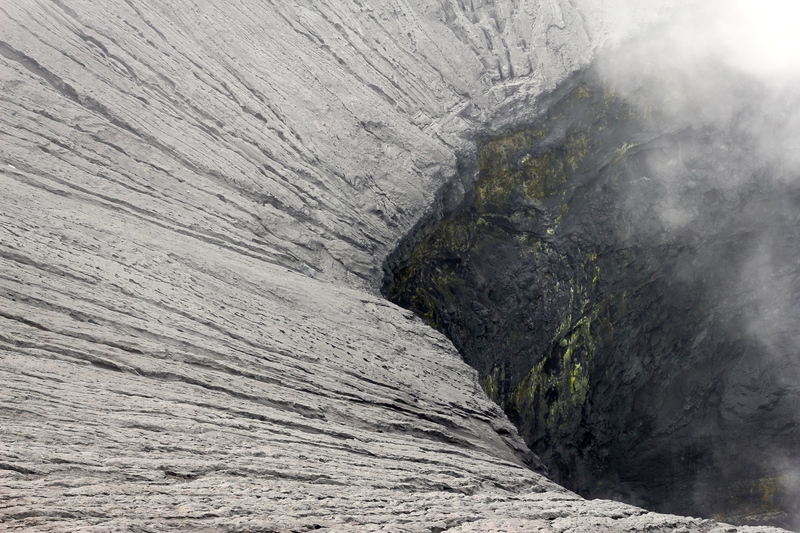 Looking into the steaming vent of Mt Bromo- imagine climbing down this! Continuing our exploration of this amazing place, we then rode off across the sand following the sandy trail to the Savannah. At the eastern edge of the Sea of Sands, the mountains closed into a narrowing valley. The greyness of the barren, harsh landscape gave way to greener than green hillsides, lush with bracken as far as you could see, plunging down to the grey floor of sand. The contrast of colours was of another world. 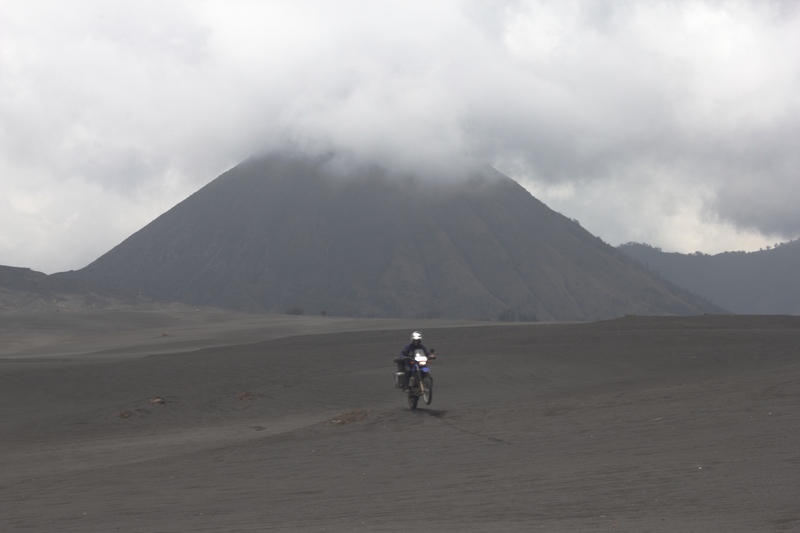 Finally retracing our route back to Bromo for one last look, we forced ourselves to leave this amazing place. We know our photos cannot possibly do justice to the landscape especially as it largely is a place of no colour. 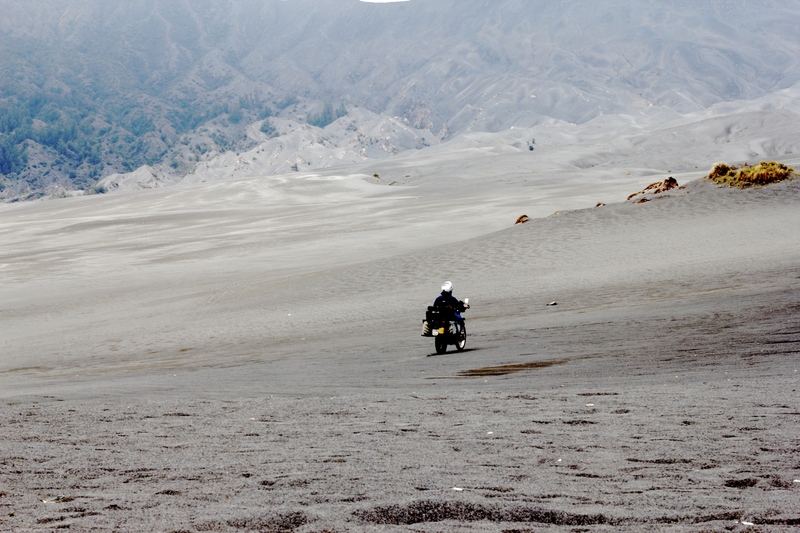 Misty clouds rolling in and out of the caldera make it difficult to capture the mystical feeling of Bromo in its sea of sand. Riding up out of the caldera we were once again greeted by the vivid contrast of the colour and lushness of the villages at its edge. We have visited many amazing places in this world, but Mt Bromo is truly unique amongst them. Following the windy road down the mountain I can’t but help think how lucky we are to be on this amazing adventure around the world. Now, I know someone else who loves Volcanoes! Zai Vaskess! Looks like you are having a wonderful ride. I hope you were not affected by the bad weather in the Phillipines? Indonesia is the land of volcanoes and scuba diving! Hey looks like an awesome trip! I’m currently planning to ride from Bali to Jakarta in July and stop via Mt Bromo to explore, came across your site whilst googling a bit of research. The only bikes we could source hire for are Suzuki Thunder 125cc’s (normal small naked street bikes with just road tyres). The question I have for you is in terms of riding across the Sea of Sand, how compacted is the sand? Would it be ok to ride a bike with normal tyres over it for a little bit if we took it slow and easy? From your photos it doesn’t look too bad so I’m wondering what you think. Bromo was definitely a highlight. When we rode there the sand was damp from rain and so was compacted. Take it easy and you will have no problems. 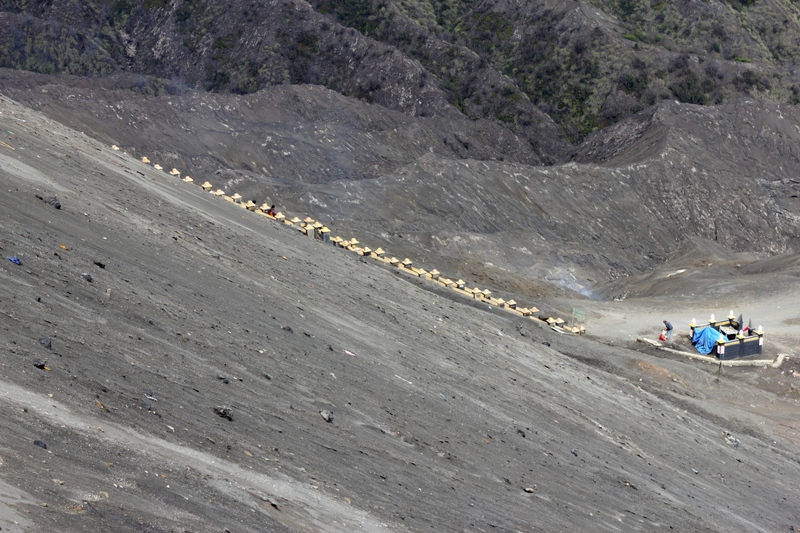 The ride across the caldera to the active vent is compacted from traffic. We ventured further to the savannah where it was softer. The locals ride on their road tyres. If you have camping gear we would recommend staying overnight. We really wish we had done that. Ps Have you also researched Ijen? Hi Thanks for this post. I too looking to ride across the East Java in July ’15 but I am not able to find any good bike rental information. Any suggestion whom should i contact for bike rental in Surabaya? Any luck or advice for renting bikes? Sorry no, maybe contact Mario from Wheel Story. Do you know him?